Whether your goal is marketing or simply communicating with your website’s online community, there comes a time when you need to send out a mass email. I am not suggesting you spam your customers or users. What I do suggest, however, is that you have some way of contacting people who were interested enough to join your site or sign up for updates. Many content management systems, such as Joomla, have mass email features built-in that allow you to easily send mail to your users. Usually, they will present you with two options: PHP Mail or SMTP. PHP Mail essentially calls a particular PHP function that will contact your mail server (such as Sendmail or Postfix) to send the email. 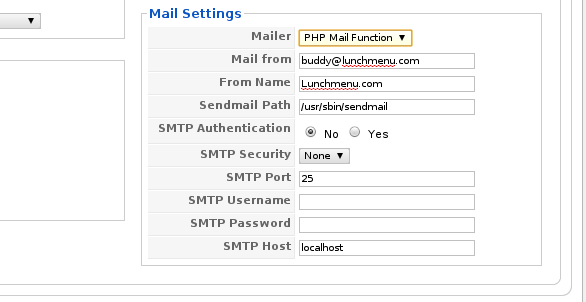 SMTP functions just like a regular email client and will login to an email account. From personal observation and the advice of people who have tried it, unless you have some pressing reason to avoid SMTP, you should prefer it over PHP Mail. Although you may not notice the difference for small mailing lists, something larger can bog down your server when using PHP Mail. It works fine for occasional contact forms, but for mass emailing, you should just go directly to the source: your mail server.